©Bert Gildart: When the lead billy goat lowered its head with its stiletto-like horns and began charging toward our small group of four, we thought we’d had it, but in reality all the band of goats was trying to do was reposition itself in preferred habitat. That was a mountain slope in Glacier National Park where the grass was lush and the escape terrain ideal, meaning precipitous. We were hiking the park’s Highline Trail with a couple that pulled in next to us in an Airstream Trailer. Don and Nancy Dennis are from Vermont, and were anxious to hike some of the park’s trails. Retired now from a career in forestry, they’re on a year-long exploration of America, and were ideal hiking companions. And so early yesterday morning, we struck out along the Highline-and soon discovered that we’d all lucked out, for our hike through this Arctic environment coincided with one of the best flower displays I’d ever seen. Right now some of the early season wildflowers are in their prime. What’s more, the amount of wildlife we saw along the way was abundant. 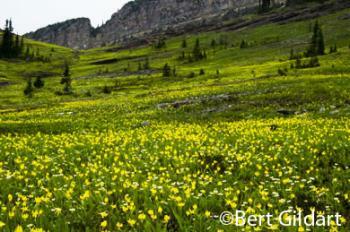 Throughout the 12-mile-long hike we tallied several dozen species of plants, but the most abundant was the glacier lily. In fact, in all the years I’ve been hiking the park as both a seasonal ranger and now as a private citizen I’ve never seen such a display in which these showy yellow plants were so vivid or so profuse. Where banks of snow were receding rigid shoots baring flowers were beginning to brave the elements, but where the banks had completely receded, glacier lilies carpeted the flanks of Mount Gould, Haystack Butte, Grinnell Overlook-and all the other mountains that reached up to touch a sky that in places was blue, other places white from banks of clouds gathering along this portion of the Continental Divide. Indeed, the Highline Trail takes you into some might lofty country. Other flowers we saw blooming included sego lily, bear grass, columbine, larkspur, penstemon, delphinium, wild onion, mallow (down in the 2003 burn), mountain heath, camas, thimble berry, cow parsnip, wild strawberry, shooting star, and spring beauty. And that’s just for starters, for there were many we couldn’t identify. We also saw a band of sheep, which we soon confirmed as a “bachelor herd” of bighorn rams. In the summer, the males disperse from the ewes and lambs and group together. And so they’ll remain until the fall, when they’ll exchange their tolerance for an intense interest in the ewes. At that time, they grow hostile toward one another. Yet another mammal we saw was the marmot, and because many hike the Highline, these robust members of the squirrel family are quite tolerant of people. We saw about a dozen and some assumed classic poses; poses that seemed to say they were the kings and queens of all they surveyed. Over the years I’ve written about marmots for several wildlife magazines, and in one story I took a trait of this mammal as my title. Marmots produce a shrill almost human-like whistle, something early French trappers picked up calling the animal Siffleur. Translated the word means “the whistler,” and that’s the name I used for my story. Hike the Highline Trail and you’ll soon see why the name is appropriate. WHERE HAVE THE PIKA GONE? 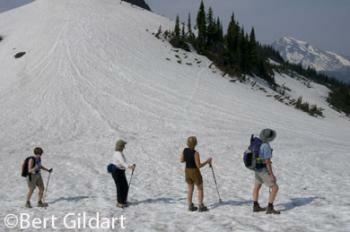 This entry was posted on Thursday, July 24th, 2008 at 6:26 am and is filed under Glacier National Park. You can follow any responses to this entry through the RSS 2.0 feed. You can leave a response, or trackback from your own site. Such a beautiful park. I would love to visit there one day. 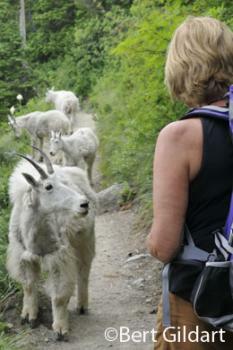 You encountered a lot of wildlife along the trail too! 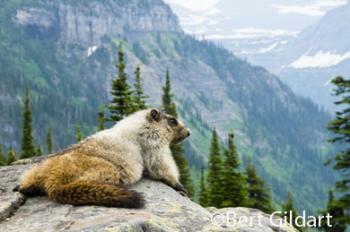 I’ve never seen a Marmot before but he does indeed look like he’s posing for you. lol ‘letting you into his world’ so to speak. Thanks for the wonderful photos and for sending us news of our good friends Don and Nancy!